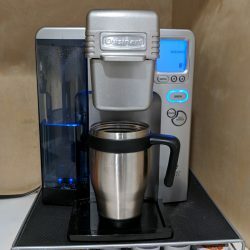 The Cuisinart SS-10 Keurig coffee machine is the best coffee machine on the planet. I have had mine since 2010 (it is now 2018) and it hasn’t failed me yet! Now before all you coffee connoisseurs go hating, let me preface this post by saying that I am NOT a coffee connoisseur! I know you probably want a french press or espresso machine. 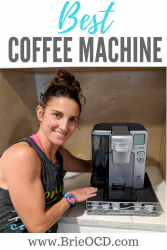 However, I am just a regular ‘ol gal, that likes regular coffee and this machine is the bomb. 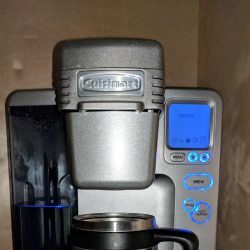 The Cuisinart SS-10 is a single serve coffee machine using K-cups (aka Keurig cups). It eliminates waste because you make a customized cup every time. It has all the best features from any Keurig machine I have seen. To see all the cool features in person, watch my YouTube Video by clicking here or below! Water toggle alerts you when you need to fill with more water. Fully programmable! – you can set the clock, daily timer to turn on and off, Set your preferred brew size and your preferred brew temp. You can use the machine to make tea, chai, soup etc using the hot water feature. Rinse feature to clean the K-cup chamber. Comes with single serve plastic K-cup so you can make your favorite (or cheap) coffee and not use the disposable K-cups. Step 1: Turn on machine. Mine is on the right hand side, but it will be a little button on either the right, left or back of machine. Step 2: Wait for the machine to heat up and for the screen to say READY. Step 3: Open the K-Cup holder by pulling up and insert the K-cup. 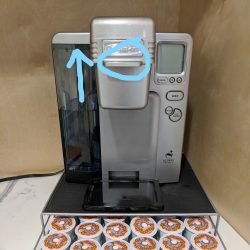 The writing on the K-cup should be facing you with the small side going into the holder. 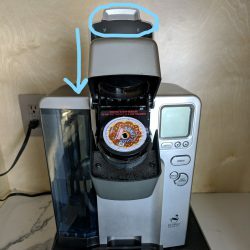 Step 4: Close the K-cup holder by pulling down and place your cup under it. 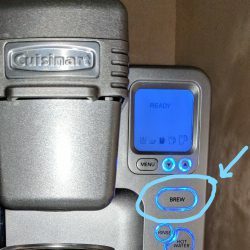 Step 6: Click on the BREW button! Step 7: Wait for coffee to be finished brewing. WHICH K-CUPS SHOULD I BUY?? I buy my K-cups at Costco because I know that I love Donut Shop. However, I suggest buying a variety pack to begin with online or at your favorite retailer to test out what brands and flavors you like. 8 years ago we bought the variety pack and I made a spreadsheet with a 1-5 rating system. My husband and I would rate the K-cup after each cup. We figured out that we loved the Green Mountain Brand. So then I found those brands and bought in bulk. I would not suggest buying in bulk until you absolutely know that you love it! Click here to buy the Cuisinart SS-10 Keurig Coffee maker on Amazon! I also love my coffee storage drawer that fits perfectly underneath the machine. (click here to view/buy the drawer!). It is recommended that about every 3-6 months you should descale the machine and change the filter. (Click here to see the filters I buy). I do NOT follow this recommendation because I am lazy LOL. I only descale and troubleshoot when the machine sounds like its broken (don’t worry, it’s not). 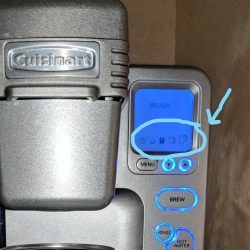 Watch Part 2 of The Cuisinart SS-10 Keurig coffee machine where I tell you how to troubleshoot and maintenance your Keurig coffee machine. As I mentioned I have had my machine for 8 years and a few times it seemed like it was a goner. It wasn’t! It just needed a little tender loving care. 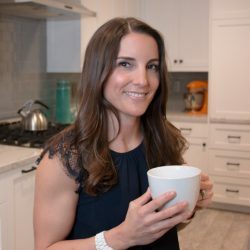 Click here to watch my YouTube video on How to Fix Any Keurig! Mine too is 8 years old. Thought it was a goner more than once. This week I’m worried. It makes a cup, then sighs and dispenses nearly a second cup of water/coffee. Thank heaven they still make it, if I can’t revive it. You can do it!! clean all the bits and bobs and run it run it run it with water and vinegar. You got this! !